Yeah, yeah. I know. It’s been like two months. This part of the summer, it always seems to just… escape. 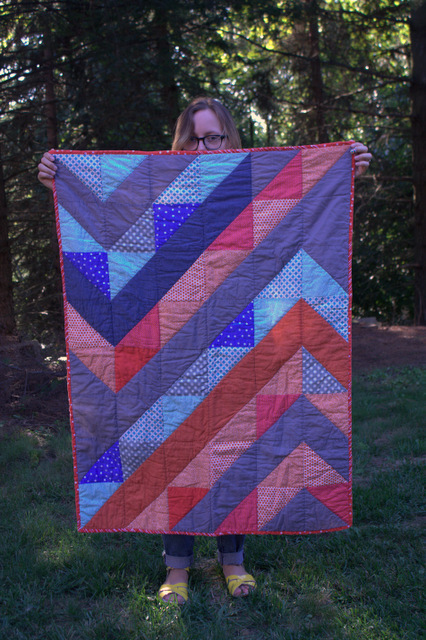 The pattern is free: Mod Chevron Baby Quilt by Rashida Coleman-Hale. This is my second quilt ever! I have to say, I’ve never been a great seamstress because I just don’t have the proper understanding of fitting… but there is something really rewarding and actually enjoyable about the way quilting lets you just play with pattern and color. I’m hoping to bug my friend for some more close-up images someday; I used lots of polka-dots and similar dotted patterns and they all play so well together. I am a wee bit sentimental about this gift, as this impending little babe is the first one being born to any of my really close friends. I’m super excited, but just a wee bit nostalgic about summers past. Seasons changing and all that. Speaking of which, my mind has definitely been drifting to fall. It’s not quite cool enough for boots but they’ve been eyeballing me for weeks now from the top shelf in the closet. And the knitting… I’m re-working my Neon Ski Bonnet pattern in multiple sizes, among other various projects half-started and incomplete. More on that soon, I suspect! I would have started breeding years ago if I knew it would get me a sweet quilt.